Yahoo has reportedly disabled automatic email forwarding and even account deletion for customers looking to leave the platform. This news comes a few days after Yahoo revealed details about a cyber attack affecting almost 500 million users. Yahoo has been on a downward spiral for a couple of years now. In between Verizon buying Yahoo for $4.5 billion and recent cyber attacks, a lot of users are leaving the platform and switching to other services like Outlook and Gmail. It turns out that Yahoo doesn’t plan to make this transition smooth. Users looking to forward their incoming mail from Yahoo account to their new accounts will be met with disappointment as Yahoo has disabled this for “development purposes.” A search for email forwarding on Yahoo help yields the following result. Email forwarding has been a part of Yahoo mail for the past 15 years. It seems odd that the feature has gone into development phase right when the company is trying to retain users who are flocking to other services. In addition to preventing users from forwarding their email, they have also apparently disabled the option to delete accounts altogether. Any attempt to delete a Yahoo accounts displays the message that “this service is currently unavailable right now and will be available at the end of September.” Apparently, they didn’t mean September 2016 as the option has still not been made available for users. Yahoo’s reputation has already been tarnished due to it being secretive about hacked user data for more than 3 years; these tactics to stop users from switching services will only contribute in tarnishing it further. 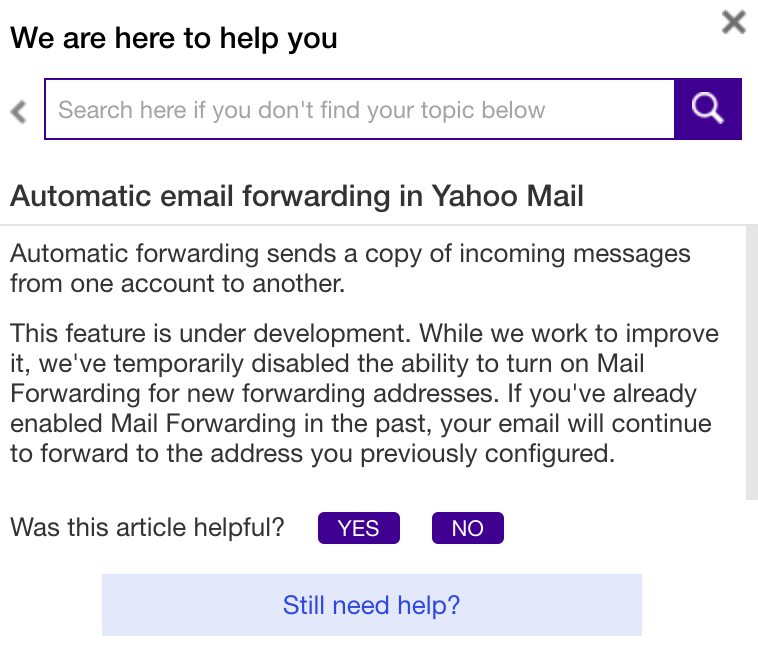 The post Yahoo disables automatic email forwarding to make it difficult for users to leave platform appeared first on TechJuice.